If you are looking for the best electric griddle reviews then be sure to check out some of the Amazon electric griddle best sellers that are listed below. Stove top griddles are great, but what I like about electric griddles is the fact that it isn’t taking up extra burners that I can be using to cook other foods, since a decent size griddle would take up two burners on the stove. I love cooking big breakfasts, and because we are on a strict food budget, we enjoy breakfast for dinner at least once a week. Griddles come in handy for making large amounts of pancakes, french toast, breakfast meats and more. And of course, griddles aren’t just for cooking breakfast. Below are some of the best rated electric griddles according to Amazon consumers. As of this writing, this Presto electric griddle is a current #1 Amazon best seller. Not only is it non stick, it is also easy to clean because once you remove the heat control you can immerse the griddle in water. You can also remove the handles for easy storage in standard size cabinets. The Presto 07061 griddle also allows you to control the heating setting and is virtually warp proof. It also features a drip tray that you can easily slide out to clean. If you often cook for a crowd then the Presto Tilt ‘n Drain Big Griddle is a great choice. At 15″x19″ the surface is 50% larger than most griddles. This electric griddle also has a tilt feature, which makes it easy to cook greasier foods like sausage and bacon while the grease drains into the drip tray. You can control the heat settings for just the right cooking temperature, and with the heat controller removed, immerse in water for cleaning. The surface is also nonstick for easy cooking and cleanup. If you are looking for an electric round griddle then the Cucinapro Griddle and Crepe Maker is a great choice. The round surface takes up less space than traditional countertop electric griddles. You also have the option to make delicious crepes and blintzes, and it even comes with a batter spreader to get the crepe batter nice and thin. There are five different temperature settings and a ready light so that you know when the griddle is at the perfect temperature. The surface is non stick which makes it easy to wipe clean. Recipes are also included. If you plan to use your griddle on a regular basis and are looking for more of a high end model then the All-Clad Electric Griddle is a great choice. Not only do you have a large cooking surface (20″x13″) you can also cook two different types of foods at different temperatures at the same time. For example, you can sear meat on one side while cooking foods at a lower temperature on the other. It’s nice to be able to cook bacon and eggs, sausage and pancakes, and other breakfast foods at the same time. This griddle features a hard anodized non stick surface for easy clean up. It also has a removable splatter guard as well as a large drip tray. The griddle has a hard anodized cooking surface with a polished stainless steel exterior. 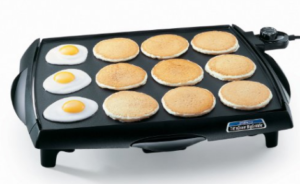 Above is just a small selection of the many popular indoor electric griddles that are available. Click here for even more electric griddles that are available. You will find several different choices depending on your price range as well as desired features and customer reviews.